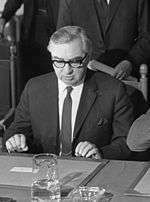 George Alfred Brown, Baron George-Brown, PC (2 September 1914 – 2 June 1985) was a British Labour politician who served as Deputy Leader of the Labour Party from 1960 to 1970 and also in several Cabinet posts, including Foreign Secretary during the Labour government of the 1960s. He was a leader of the Labour Party's trade union right wing, and an effective election campaigner. Ultimately, however, he was unable to cope with the pressures of high office without excessive drinking. He was always known simply as "George Brown" and, upon being granted a peerage in November 1970, he insisted on combining his first name and surname to create the title Baron George-Brown of Jevington in the County of Sussex. Brown was born at Flat 22, I Block, Peabody Buildings, Duke Street, Lambeth, in his maternal grandmother's flat, which was in a working class housing estate built by the Peabody Trust, a housing charity. Soon after the birth, his family left and moved to the Peabody Trust block at Peabody Square, Blackfriars Road, Southwark, near Waterloo station. His father, also called George Brown, had worked as a grocer's packer, lorry driver and served in World War I as a chauffeur to senior British Army officers. Brown attended Gray Street Elementary School in Blackfriars where he did well enough to pass an entrance examination to the West Square Central School, a junior grammar school and now part of a conservation area. Brown had already adopted his parents' left-wing views and later claimed to have delivered leaflets for the Labour Party in the 1922 general election when he was 8 years old. Shortly after his marriage to Sophie Levene on 27 April 1937, Brown was employed as a ledger clerk with the Transport and General Workers Union, and appointed District Organiser for Watford the next year. By now Brown was active within the Labour Party and the Labour League of Youth. He ran as a moderate candidate for the Chairmanship but at the Labour Party conference in 1937 he was defeated by Ted Willis, a left-wing candidate later known as a television scriptwriter. At the 1939 Labour Party conference Brown made his mark by a strong speech demanding the expulsion of Stafford Cripps for his advocacy of a Popular Front. For the rest of his life, Cripps refused to speak to Brown. After the outbreak of World War II in September 1939, Brown volunteered for the RAF but Ernest Bevin, the minister of labour, kept Brown and other trade union officials in their civilian jobs. Bevin was one of the Labour leaders brought into the wartime coalition government. Brown himself served as a temporary civil servant in the Ministry of Agriculture from 1940 onwards. Brown was a partisan participant in the Labour Party's internecine struggles in the early 1950s, opposing the Bevanite campaign. His natural campaigning ability became prominent, but also his tendency to be rude to those with whom he had disagreements. Shortly after the 1955 general election, Brown was elected to the Shadow Cabinet for the first time; from that December Brown found it easier to win promotion as his friend Hugh Gaitskell became Leader of the Labour Party. Brown had a private but widely publicised shouting-match with Soviet leaders Nikita Khrushchev and Nikolai Bulganin when he was part of a Labour Party delegation invited to dine with them on their British visit in April 1956. In October that year, he lost the election for Treasurer of the Labour Party to Aneurin Bevan by 3,029,000 to 2,755,000 votes. Brown's drinking became more pronounced as he became depressed by his loss of face in July 1966. His reaction to his depression was to launch vituperative attacks, for example at the son of newspaper proprietor Cecil King in October 1967. In 1968, he publicly insulted the wife of the British ambassador to France, Sir Patrick Reilly, at a dinner party at the French embassy in London, and later ended the ambassador's career over personal differences. After Wilson was told of the incident with King, Brown came round and told Wilson that he had just had a terrible row with his wife and could not continue in Government. More and more people were becoming aware of Brown's alcoholism, and Private Eye magazine managed to hint at the scandal with a parody of a memo titled "Brown: F.O. Acts". The memo gave translations into various languages for the words tired, overwrought, expansive, overworked, colourful, and emotional, and coined the phrase "tired and emotional" as a euphemism for drunk. In 1978, George-Brown hired a young Canadian woman, Kathy Mason, as his personal secretary, and she worked for him until the spring of 1980. At that time, before returning to Canada, Mason trained the newly hired Maggie Haimes, then aged 31, to fill her position. Two years later, on 24 December 1982, after 45 years of marriage, Brown walked out on his wife and set up home with Haimes. 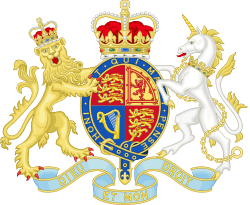 He did not, however, change his 1969 will which gave his estate to Lady George-Brown. ↑ "About us". City Lit. Retrieved 2016-07-26. ↑ Kenneth James. "Sir Patrick Reilly". The Guardian. Retrieved 2016-07-26. ↑ "Patrick Reilly". Oxforddnb.com. Retrieved 2016-07-26. ↑ Paxman, Jeremy. "Book Review / Intrigue, infighting and cold sausage rolls: Jeremy Paxman on George Brown, whose career was a triumph of chippiness - 'Tired and Emotional: The Life of Lord George Brown' - Peter Paterson: Chatto & Windus, 20 pounds". independent.co.uk. The Independent. Retrieved 21 November 2014. ↑ O'Farrell, John (15 April 2010). An Utterly Exasperated History of Modern Britain. London: Black Swan. p. 174. ISBN 9780552775465. Retrieved 21 November 2014. ↑ Brown, Craig (20 August 2013). Hello Goodbye Hello: A Circle of 101 Remarkable Meetings. New York: Simon & Schuster. p. 78. ISBN 9781451684513. Retrieved 21 November 2014. ↑ "The Westminster Hour: Not while I'm alive, he ain't - Part 2". BBC News. 2002-04-05. Retrieved 2016-07-26.